Today is an anniversary, of sorts. 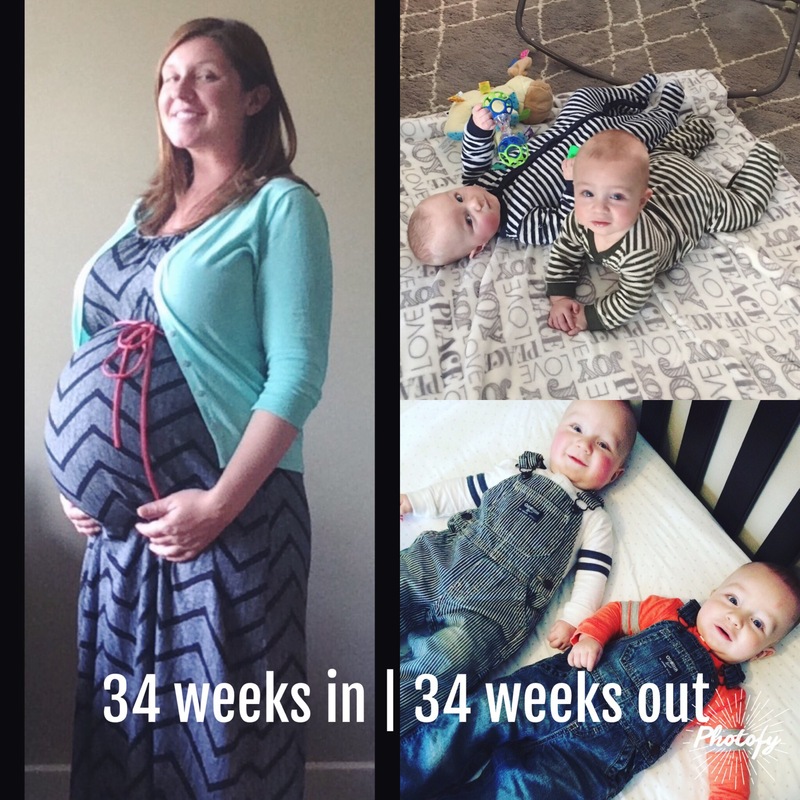 Today marks 34 weeks that my babies have been here, on the outside. Because that’s also how long they were on the inside. And perhaps that’s pretty insignificant to most people, but it feels special to me. The past 34 weeks have been, without a doubt, the best 34 weeks of my entire life. So many smiles, tears, ups, downs (but really, mostly ups). So much laughter and LOVE. So. Much. Love. But that’s not to say the 34 before this weren’t special too. Maybe it’s the time of year & sort of reliving my pregnancy on the other side, maybe it’s that it seems many people are pregnant right now, or perhaps it’s even that I see my babies growing & developing so quickly. I don’t know but something has me really missing being pregnant these days. I know how lucky I am to have experienced being pregnant at all, let alone carrying two babies at once. And let me tell you, luck doesn’t begin to describe how I feel about actually being a mom to these guys. There are truly no words to describe how that feels. I’ve learned, in the past 34 weeks, that there are no limits to my love. And in the 34 weeks before that, I learned that there is simply no way to prepare for the ways in which your world will change. But you can prepare for each week beyond the birth of your child(ren) to be the best of your life. It just keeps gettin’ better. waaaaah, trisha, why you gotta pull at my heartstrings like this on a Wednesday morning? this is almost too much for me! what with that belly, and those two chubby-cheeked gentlemen, I cannot handle the adorable factor. I remember thinking the same thing when Amelia was 40 weeks old…she’s been out as long as she was in, and now life keeps moving forward, and it’s just all so amazing. I also miss being pregnant lately. that feeling of your body doing something so crazy wonderful, and keeping a baby (or babies) alive by yourself is something that can’t be described or replicated. I totally get what you’re feeling.